Smartphones are expensive. Ordinary, "dumb" cell phones are cheap. The trade-off is that basic candy-bar phones are inferior and no fun, and they can't perform highfalutin tasks such as play Super Monkey Ball. Well, that's what you thought. Your basic feature phone can do more than you think. You won't be able to play games like the ones iPhone users enjoy, but a whole world of services out there can turn any phone into a powerful tool for staying productive and having fun. And if you’re limited to using landlines, I have a few handy tips for you, too. A word of caution: Many of the services described below depend on SMS messaging and consume your cell phone plan's minutes. You might discover that using any one of these services in excess will drive your monthly wireless bill up. For other tips and tricks to liven up your mobile phone, see "14 Ways to Supercharge Your Smartphone" and "13 Sites and Services to Supercharge Any Phone." You don't need a fancy camera phone or smartphone to do comparison shopping on the fly--Frucall will check prices for you via SMS, or a regular phone call, for free. All you need to do is text FRU11 (3811) or call 888/DOFRUCALL (888/363-7822) with a product's bar-code number or a book's ISBN, or send the product name and model number (SMS only). Frucall will then return pricing information for that product at a number of online retailers. Punch in your zip code, and Frucall will factor shipping into the price. Frucall will work only with supported carriers, including Alltel, AT&T, Sprint, T-Mobile, and Verizon Wireless. Google offers a similar SMS-based service. With Google Mobile set up for your phone, you can SMS "price" followed by the product name, or the UPC or ISBN. Google and Microsoft each offer free business directory assistance services. Google's is called GOOG-411 (800/466-4411), while Microsoft's is Bing411 (800/246-4411). Both will connect you to the number you look up, for free. Each represents an attractive alternative to paying the nearly $2 fee that most mobile carriers charge for the service. In addition to the business directory assistance, Bing provides driving directions, traffic, movie times, horoscopes, weather, sports, stock quotes, cheap gas, news headlines, or travel information (which includes services such as finding a taxi). For residential phone number lookups, you can try 1-800-Free411 (800/373-3411), which offers both business and white-pages listings. You'll have to listen to an audio ad as part of the bargain. Yet another alternative is Tellme (800/555-TELL, or 800/555-8355); on this service, you can do a business search or request stock quotes, sports news and scores, weather forecasts, movie times, horoscopes, airline listings, and more. 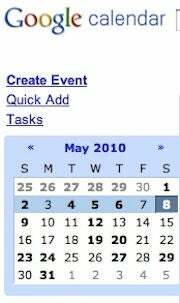 If you use an online calendar service from Google, Windows Live, or Yahoo, you can access some of your calendar tools and information via SMS. All of these services require you to set up access via the Web first. Google: Users of Google Calendar can perform a variety of calendar tasks by texting GVENT (48368). You can also set up Google Calendar to send you SMS alerts for new, changed, or canceled event invitations. The downside of Google Calendar for SMS is that not all carriers support the GVENT shortcode; consult Google’s supported carrier list to see if your phone can use GVENT. For more information, see the Google Calendar SMS help page. Microsoft Windows Live: If you use Windows Live Calendar, you can set up your account to send you calendar reminders via SMS. Windows Live alerts are customizable, too, so you can set quiet hours to make sure you don't receive any calendar reminders in the middle of the night. You can also use Windows Live alerts to receive Hotmail and Windows Live network updates, as well as news updates from Fox Sports, MSNBC, Nasdaq, Newsweek, and other sources. To get started, go to calendar.live.com on your computer, select More options in the upper-right corner, and then click Change how you get reminders. Just as with Google Calendar, not all U.S. carriers support the Windows Live service, and regular messaging rates apply. Yahoo: To set up calendar reminders from Yahoo Calendar, go to calendar.yahoo.com, select Options in the upper-right corner, and click Reminders. You can use text messages to send and receive status updates on social networks such as Facebook and MySpace. If you're a die-hard Twitter user, you can also use SMS to perform any number of functions. Here are just a few commands you can enter (see Twitter's FAQ on SMS access for more information). Before using SMS with Twitter, it's a good idea to sign up for an SMS plan that allows for an unlimited number of messages per month. You’ll also have to go through a relatively lengthy verification process with Twitter to start using its SMS service (usually involving about four to six SMS messages from each side). To get started with Twitter via SMS, visit twitter.com/devices or text "START" to 40404 (United States only; Twitter users outside the U.S. can check Twitter's help page to see if the SMS service is offered in a particular country). Facebook has some limited services that you can use with almost any phone. Visit your Facebook Account Settings page and select Register for Facebook Text Messages under the Mobile tab. Once you’ve gone through the registration process, you can receive texts for friend requests, messages, wall posts, and your friends’ status updates. You can also update your own status via text message, and search for phone numbers for friends who have added their number to their profile. If your phone supports multimedia messaging (MMS), you can also upload photos and videos. Just because you don't have a smartphone, that doesn't mean you can't search the Web to find what you're looking for on the go. Text GOOGLE (466453) from within the United States with your search query, and the search giant will text you back with the results. You can also use Google's SMS search to find everything from the nearest FedEx store to the closest pizza joint. Google can serve up 22 different types of data, including driving directions, flight information, and the latest weather report. Just start your SMS request with the subject you're looking for, such as "weather," "movies," or "local" (for local business search). If you're looking for the weather forecast in Bloomington, Indiana, for instance, you text "weather: Bloomington, IN” to 466453. To see more examples of typical SMS queries, visit Google’s Mobile SMS page. Google’s SMS search is a handy way to find information in a pinch, but remember that regular message rates apply.